Marketing practices are linked with satisfaction of targeted customers and to fulfil their emerging needs and wants in efficient way as compared to business rivals. Marketers are involved in analysing rising customer trends that suggest new marketing opportunities. It is imperative to adopt a holistic marketing orientation in order to understand customers and the bases for their choices. A consumer market is a marketplace that comprises of household consumers who buy goods for individual or family utilization. It is dissimilar than a business market, in which businesses trade goods and services to other companies. The consumer market pertains to buyers who buy goods and services for consumption rather than resale. It is asserted that all customers do not have similar choices, preferences and buying habits because of different characteristics that can differentiate certain consumers from others. These particular consumer characteristics consist of various demographic, psychographic, behaviouralistic and geographic traits. Marketers usually characterize these consumer characteristics through market segmentation, the process of separating and recognizing prime customer factions. Demographic Characteristics of consumer markets are based on demographics such as dissimilarities in gender, age, ethnic background, income, occupation, education, household size, religion, generation, nationality and social class. Companies often categorize these demographic characteristics through market research surveys. From survey results, companies used to discover which demographic groups comprise the majority of their customer base. Companies can then focus their advertising towards these demographic groups. Psychographic Characteristics: In consumer market, Psychographic characteristics can also be found that include interests, activities, opinions, values and attitudes. Consumer activities can include partaking in martial arts or basket weaving. Opinions and attitudes can be both precise and general. A company may better recognize consumer opinions and attitudes after conducting a focus group, and can use that information to modify advertising or marketing campaigns. Consumer values can affect to how a group of individuals feels about some social issues, which can be of interest to non-profits or charitable organizations. Behavioralistic Characteristics can also be gained through marketing research. Behavioralistic characteristics of consumer markets include product usage rates, brand loyalty, user status or how long they have been a customer, and even benefits that consumers seek. Company marketing departments usually try to differentiate between heavy, medium and light users, whom they can then target with advertising. Marketers interested to know which customers are brand loyalists, as those consumers usually only buy the company's brand. Geographic Characteristics: Consumer markets also have diverse geographic characteristics. These geographic characteristics are often based on market size, region, population density and even climate. It is well established in marketing studies that Consumer behaviour is the study of how individuals, groups and organizations select but use and dispose goods services, ideas or experiences to gratify their requirements. A marketer must be fully knowledgeable of both theory and reality of consumer behaviour. Consumers make many buying decisions each day. Majority of companies investigate consumer buying decisions to explore the needs of consumers and their buying pattern such as where they buy, how and how much they buy, when they buy and why they buy. A consumer buyer's behaviour is affected by cultural, social and personal factors. Cultural factors put forth great influence on consumer behaviour. The marketers must understand the role played by the buyer's culture, sub culture and social class. Culture is a set of basic regulators, perception, wants and behaviours learned by numerous societies from family and other important institutions. Every group or/society has different culture and cultural influences on buyer behaviour may differ greatly from country to country. Sub culture is a group of people who share some common values based on their life experiences and situations. Sub culture includes nationalities, religions, geographic region. Many sub cultures constitute important market segments and marketers often propose products and marketing programs customized to their needs such as Hispanic consumer African/American, Asian American Nature consumer. Social Class is comparatively permanent and ordered divisions in a society whose members share same values, interests and behaviour. Consumer behaviour is also affected by social factors such as the consumer's small groups, family and social roles and status. 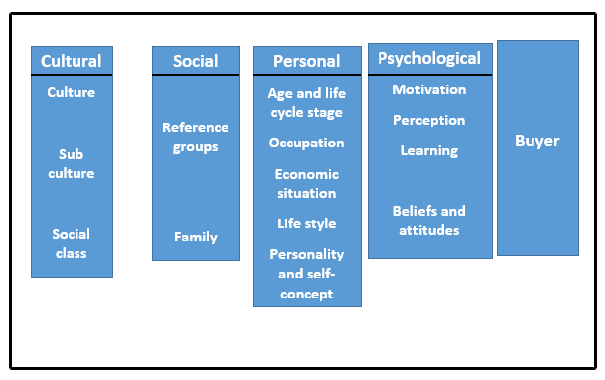 Personal characteristics impact a buyer's decisions such as the buyer's age and life cycle stage, occupation, monetary situation, life style and individuality. A person's buying choices are also influenced by major psychological factors such as motivation, perception, learning and beliefs and attitude. It can be maintained that Consumer markets denotes to the acquire goods and services just for personal consumption. Consumer markets and consumer buying behaviour have to be understood before developing marketing plan. It is advised that organizations need to know and understand the behaviour not only of their own customers but all consumers in general to offer products and enhance profits. Consumer behaviour is the learning of how individuals, groups, and organizations choose, purchase, use, and dispose of goods, services, or experiences to gratify their needs and wants. Marketers thoroughly comprehend the consumer behaviour for business success. A consumer's buying behaviour is impacted by cultural, social, and personal factors.